Vina Croatia preserves and embodies Croatia’s historical heritage, natural riches, multicultural tradition and original grape varieties. Croatia is located where the hot Mediterranean meets the cold Alpine climate zones, and where, historically and culturally, East meets West. This is what makes the wine culture in Croatia very unique. The sheer number of native varieties that have developed here by adapting to both the climate and the local customs are proof enough. 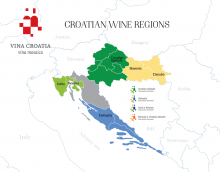 Due to its unique shape and extreme variations in climate, Croatia is divided into four wine regions, sixteen sub-regions and 66 appellations. The four wine regions are located in the four corners of the country, and each has developed its very own specific varieties that best personify the geographical features, climate and customs. Their original, unique style will enable you to savor the terroir and experience modern expressions of old winemaking traditions. We invite you to taste Vina Croatia, and “Taste the Place”.